Thomas arrives in the Glade shortly before a girl – the first girl ever – does. He has no memory of where he came from. 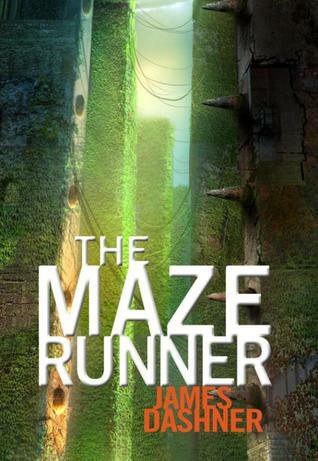 He becomes a Runner, and helps map out the Maze that surrounds the Glade. He discovers that he and the girl, Teresa, worked with the Creators against his will to create the Maze and the codes. The teenagers are all part of some sort of trial. Thomas helps everyone get out, although his friend and half of the Gladers die in the process. The teens are rescued from the Creators and taken to a dormitory. It’s revealed that the whole rescue was fake, and it’s part of another trial, although Thomas doesn’t know this yet. Thomas arrives in the Glade via an elevator called the Box. He’s immediately surrounded by about fifty other boys, none of whom he knows. He has no memory of his life before arriving in the elevator. A boy called Alby is in charge of the Gladers. Thomas becomes friends with a boy called Chuck. Thomas sees a kid with bruises and bloodshot eyes, and is told he’s going through the Changing. There’s a big will surrounding the Glade with doors that close every night. Each day, Runners go out and try to map the Maze outside. The walls shift each night so this is next to impossible. Thomas gets the feeling he’s been here before. A girl shows up in the Box. She’s the first girl to ever arrive in the Glade. She’s half-dead. There’s a piece of paper that tells the Gladers that she is “the last one ever”. Thomas sees the word WICKED scrawled on the back of a beetle blade (a metal bug). Ben, the sick boy, tells Alby that he needs to kill Thomas because he’s bad. Alby shoots Ben and then banishes him from the Glade. A Griever kills Ben while he’s in the Maze. Minho, a Runner, returns early one day because he found a dead Griever in the Maze. Thomas tells everyone that he wants to be a Runner, but he’s sent to work on the farms instead. Alby and Minho return late one night. The Doors are about to close, and Alby is injured. They never would have made it in on time. Thomas runs out on instinct and gets trapped outside with them. It turns out that Minho’s dead Griever wasn’t really dead, and Alby had been stung. Since they’re trapped outside in the Maze, they can’t get Alby any Serum. He’s likely to die. Thomas and Minho hear Grievers coming. Minho tells Thomas that they should split up, and he runs. Thomas hides Alby up in the ivy that dangles from the walls. He hides up there with Alby, but a Griever soon sees him and starts coming after him. Thomas takes it out, but there are more. Thomas runs into Minho again, and they run to the Cliff, which the Maze has been built next to. They lure the Grievers over, and all four Grievers fall off the Cliff and disappear. Minho experiments with a rock, but it doesn’t disappear like the Grievers did. The Doors open, and Newt helps everyone inside. Alby has begun the Changing. The Gladers have a meeting to talk about Thomas and how he broke the #1 rule of not leaving the Maze after dark. They discuss what to do about him breaking the rules. Minho nominates Thomas to replace him as Keeper of the Runners. Thomas becomes a Runner. Alby asks to speak with Thomas. Alby is starting to get some memories back. He says he knows who the girl is, and he tells Thomas and Newt to be careful with her. He tells Newt to protect the Maps. Thomas goes to see the girl. He hears her voice inside his head. She says that she and Thomas “did this to them”. Thomas promises Chuck he will get him home. Minho starts training Thomas as a Runner. They run in the Maze together, and Thomas sees a bit of metal with the words “World In Catastrophe: Killzone Experiment Department”. Thomas hears the girl’s voice inside his head again. “Thomas, I’ve just triggered the Ending.” When he wakes up, the sun has disappeared. Thomas and Minho go running together again, and they see a Griever. It seems to be playing dead. It jumps off the Cliff and disappears somehow. Thomas and Minho figure the Grievers have been leaving the Maze somehow. They discover a spot over the side of the Cliff where things can disappear. It’s only about one metre wide. They call it the Griever Hole. The girl wakes up. Her name is Teresa. She tells Thomas that the Maze is a code. She has “WICKED is good” written on her arm. The Doors don’t close that night, and Gally goes missing. However, he soon comes back and starts screaming about the Grievers and how they’re going to kill everyone, one person per night. He blames Thomas, of course. He also starts talking about Variables. He tells Thomas to not go back into the real world. A Griever takes Gally. Minho tries to follow him through the Maze, but he returns and confirms that they went down into the Griever Hole. Someone burned all the Maps and knocked Alby out. Thomas talks to Minho, and Minho reveals that they had hid the Maps and replaced them with dummies after Alby’s warning. Minho takes Thomas o see the Maps. Thomas gets some wax paper and traces the last few days of Maps. The Maze spells out FLOAT, CATCH, BLEED, DEATH, STIFF, and PUSH. Thomas gets stung by a Griever on purpose so that he can get his memories back. Thomas tells everyone that the whole Maze thing has been a trial by the Creators. They want winners/survivors to do something important. The teens were taken when they were young. Everyone is named after people like Einstein, Newton, and Edison. Thomas was there when the Creators started the trials. Thomas and Teresa were forced to help the Creators. They’re telepathic. They helped to create the Maze. Thomas tells everyone they have to go down the Griever Hole to escape. Alby reveals that he burnt the Maps. He doesn’t want to leave the Glade because of a disease in the real world called the Flare. Minho tests the Griever Hole one last time before everyone sets off. Mostly everyone leaves the Glade to escape. The Grievers block their path to the Cliff. Thomas, Teresa, and Chuck manage to get through and into the Griever Hole while everyone else fights off the Grievers. A Griever follows them while Teresa tries to put the code words into the computer. It won’t let her put the last word – PUSH – into the machine. Chuck tells them to press the big red button that says “Kill the Maze”. A door slides open. Minho and Newt, along with half of the Gladers, jump down into the room. They say the other half died in the Maze. Everyone slides down a chute. The Creators are down there. A woman and a man welcome the Gladers back. Gally is there too. They can control him. Gally tries to stab Thomas but Chuck jumps in the way and dies. Several men and women arrive, Terminator-style, “Come with us if you want to live”. They lead the teens out of the building and onto a coach. A woman with the Flare sees them and tells them to not listen to the rescuers. The rescuers drive the teens away. Someone tells them that the whole thing started with sun flares. Heat slammed into the Earth, destroying the ecosystem. Loads of people died, and the sickness started. There’s no cure. The teens are taken to a dorm, and Teresa is split up from the rest because she’s a girl. Thomas says he thinks they’re safe. In the epilogue, there’s an email from a Chancellor that says that the test with Group A was a success. The rescue was faked. There’s also a Group B.
Grievers – Weird metal creatures that only come out into the Maze at night and try to kill the teenagers. The Maze – Surrounds the Glade. The walls shift every night, but Runners still try to map it. Runners – Teenagers who run in the Maze during the day and try to map it and find a way out. The Changing – What happens to you when you get stung by a Griever. If you go through the Changing, you get some of your memories back from your life before the Glade. Serum – Helps treat the Changing. The Flare – A deadly disease to which there is no cure, only treatment for the terribly rich.